Still spicy ginger snaps coated with rich dark chocolate. 28 cookies in the new extra large box. These are sinful cookies you will love with a strong ginger snap cookie thickly wrapped in incredibly wonderful dark chocolate. An addictive combination that is hard to live without. Definitely not for children - this is a cookie for adults only! 28 cookies in each 17.6 oz. box. Sorry, but this box cannot be giftwrapped. A family owned business, Borders Biscuits has a legacy of original recipes that have been winning a unique reputation and quite a few awards over the last 20 years, culminating in the Biscuit World Cup 2003. Their ultimate secret ingredient however, is people. 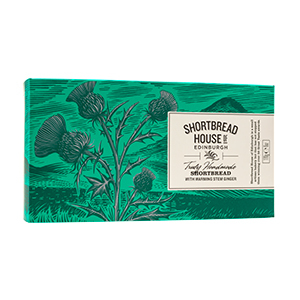 Coming from the local villages and market town and following in the Scottish tradition of unhurried home baking using good honest ingredients, they tray bake in small batches, creating biscuits which melt in your mouth and taste as fresh as if they were baked in your own kitchen. 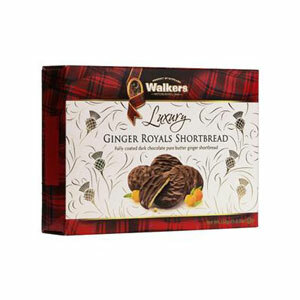 A number of years ago, we discovered dark chocolate ginger cookies in Scotland. Much as we love the Stem Ginger cookies, the combination of dark chocolate with the ginger is perfect. We haven't found them anywhere except Scottish Gourmet. Please keep them in stock! Crisp, gingery cookies coated in dark chocolate ... what could better? 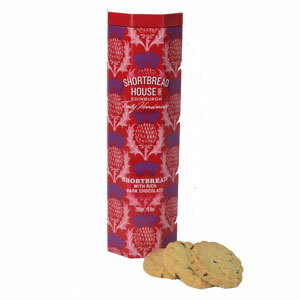 I discovered them while visiting Scotland ten years ago, and was thrilled Anne was selling them stateside. I buy multiple boxes every year. A real hit with ginger lovers!